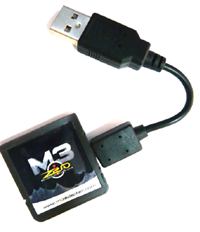 Another innovation from the M3 team, the M3i Zero is an updated M3 Real card released in July 2009. Designed as an NDS, DSi and Nintendo 3DS compatible backup flash card, M3i Zero is one of the first two cards, the other being Supercard DSONEi, to bypass Nintendo DSi’s blocking system. Not so long ago, Nintendo updates their system to block all DSi compatible flashcarts already released at that time. However, the M3i Zero team developed a dedicated hardware that can be use to upgrade their card’s core kernel and make it compatible with the latest DSi firmware. M3i Zero comes in a ‘dead’ state, meaning you have to flash the firmware to use it. The process is rather short and easy. All you need to do is download the f_core.dat file, copy paste it to the root of your microSD/SDHC, insert it in the M3i Zero, connect to the flashing cable that came with your flash card, and then connect the other end to a USB port. You will see a red light flashing and when it stopped, the M3i Zero have its core firmware. Two OS can be loaded to M3i Zero, either the old Touchpad OS or the recently released M3Sakura. If you want to get game fixes earlier, the better choice would be Touchpad. But if you want a nicer-looking interface, M3Sakura has better GUI copy. This review is base on M3Sakura. The M3i Zero claimed to have a 100% game compatibility, and so far it has not let us down. The Application Software tab keeps track of the games you played recently and acts as a shortcut so you can go back to your game in no time. Cheats can be set to off, always on, on/off, and instant codes. It supports up to 32GB of Micro SD or SDHCs to accommodate tons of games, music and videos. The soft reset function lets you turn your DS back to the main menu without having to turn your console off and then on. Real-time save lets you save your game anywhere, anytime in the game. Backing up your saves is also possible by getting to the NDS settings menu. A handy feature that not many flash cards offer. Homebrew compatibility can be improved as M3 Sakura cannot really patch all games. Using the old Touchpad can be a resort, but that will sacrifice some attractive GUI. A solution would be to stick with DS games as the flash cart is more compatible with DSi’s. The M3i Zero is designed for easier navigation. The M3i’s interface has one of the most graphically pleasing and well laid-out interfaces out of all the NDS and DSi’s backup flash card out there. The interface is not as complex as DSONEi’s and not bulked up by extra settings that could cause certain problems. Using Sakura as an OS to M3i Zero brings a couple of added features. One is a PDA organizer that has a date calendar, and also doubles as a calculator. The others are pre-loaded homebrew applications especially compatible with Sakura OS. A multimedia player is built-in the flash cart that supports MP3 and video files. The in-house media player is designed to replace Moonshell and since Sakura is based on the latter, you don’t have to boot it at all. You can browse through the folders and listen to your favorite music simultaneously. You can even use the player even if your DS’ shell is closed, acting like an MP3 player on the go. As a NDS and DSi’s backup flash card, M3i Zero is pretty well at par with other DSi compatible carts and except for the upgradeable software, does not offer much than its DS/DSL counterpart. However, the added features like real-time save, cheat support, built-in media player, and ROM compatibility makes it a class of its own. Minor troubles like sound glitches can be fixed with little sacrifices (closing the shell or turning of the sound). Homebrew enthusiasts may not welcome the M3 Zero with a warm hug, but if you are a DS fan, this NDS and DSi’s backup flash card I just for you.